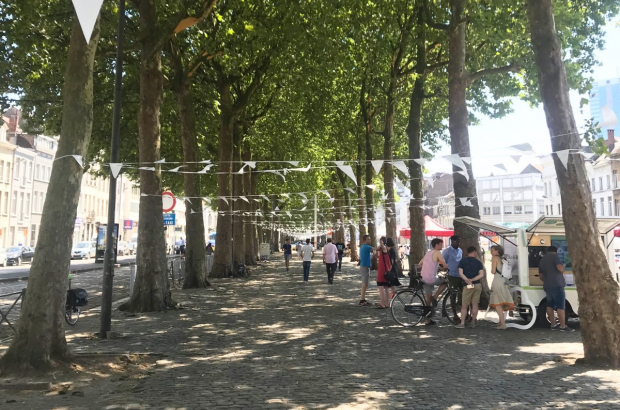 The meridian strip separating Boulevard Poincaré from Boulevard du Midi in Anderlecht will soon be home to “the longest bench in Brussels,” according to mobility minister Pascal Smet. The minister announced the neighbourhood project during a neighbourhood New Year’s drink at Porte d’Anderlecht. One of those is ‘the longest bench’, one continuous bench that will be built on the cobblestoned meridian along Boulevard Poincaré. Led by construction co-operatives, different neighbourhood organisations will build sections of the bench, which will be joined together. The bench will be temporary, Smet confirmed. “It’s a precursor to the relaying of the meridian,” he explained. That project will be carried out by the winner of an ongoing design contest. Previously, the meridian was open to parking. Any neighbourhood group wanting to help build the bench should contact ConstructLab before March.